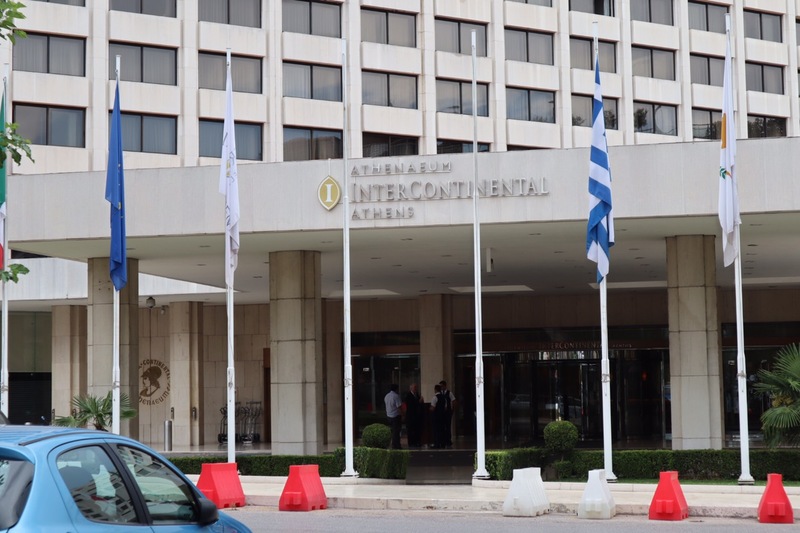 For a great stay in Athens, try the Athanaeum Intercontinental. 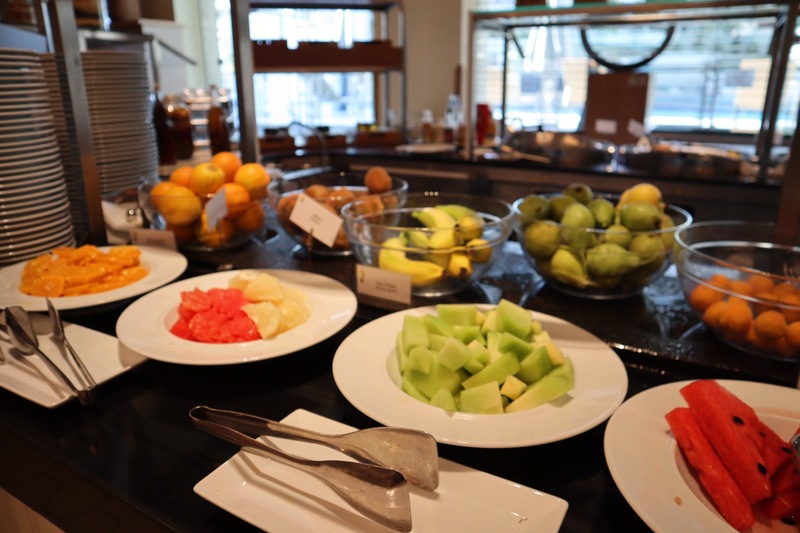 The five-star hotel is located on Syngrou Avenue, 89-93 between Lagoumitzi and Aftoktat Nikolaou Streets. It sits in the heart of the Neos Kosmos (New World) neighborhood, about two miles south of Syntagma Square, the city center. Fortunately, the hotel offers a free shuttle service every 30 minutes to Syntagma Square starting from 8AM until 10:30PM. 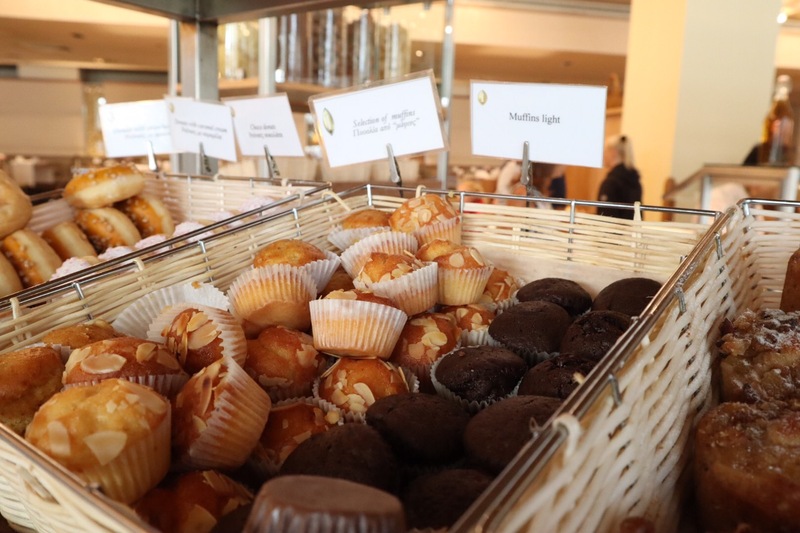 To enter the hotel, you pass through a revolving door –that opens into an expansive lobby decorated with cream-colored walls, marble floors and columns. 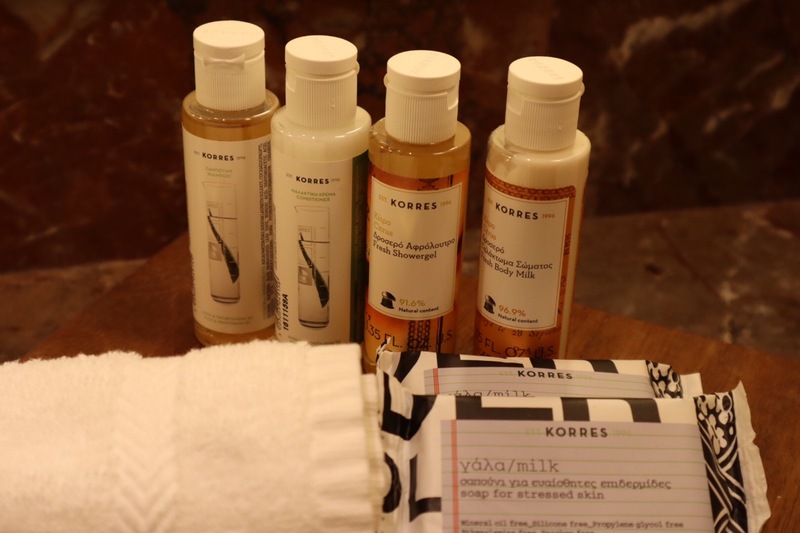 You might expect marble at a luxury hotel in Athens. What you might not expect is such modern sculpture in this classic city. 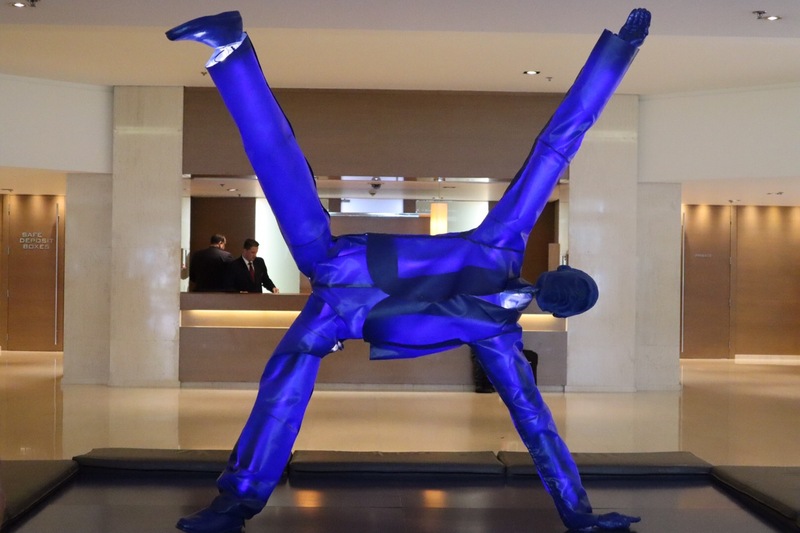 The Blue Man (pictured below) was done by George Lappas. This particular sculpture is composed of steel, neon, canvas and aluminum. 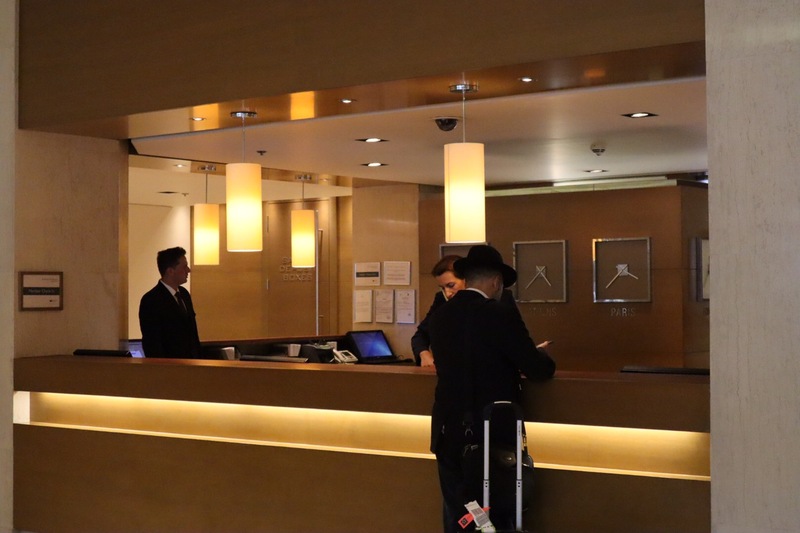 A professional staff who speaks multiple languages is on-hand to greet you around-the-clock and answer any questions you might have about your stay in Athens or Greece. I stayed in room 214. 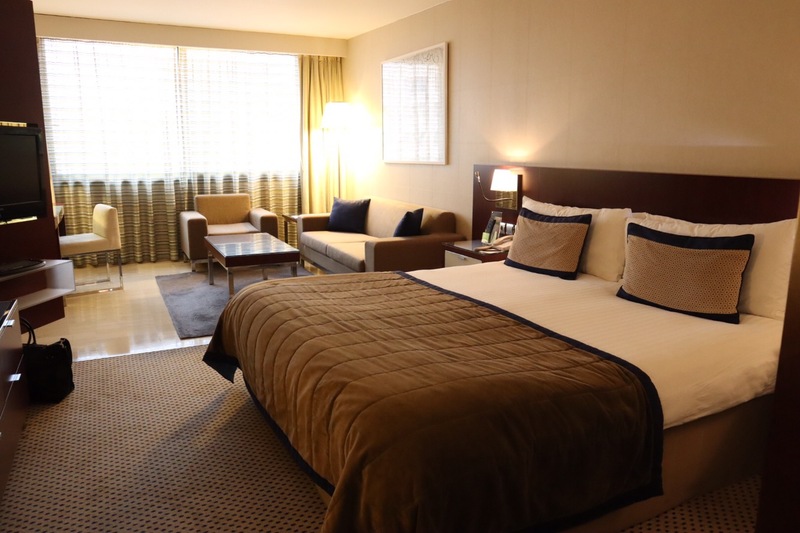 It is classified as a Superior Room. As you can see, the accommodation included a king-sized bed. 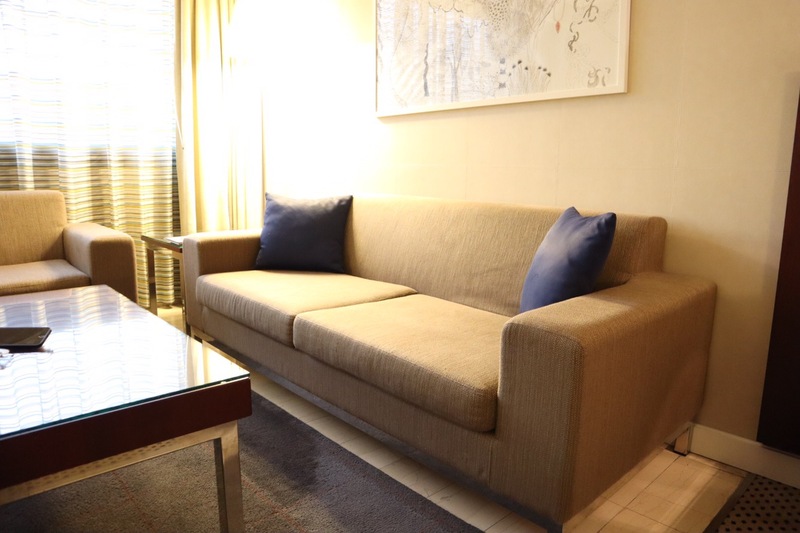 The Superior Room also features a seating area complete with a couch, arm chair and coffee table for entertaining guests or sipping your morning cup of Joe before heading out to The Acropolis. 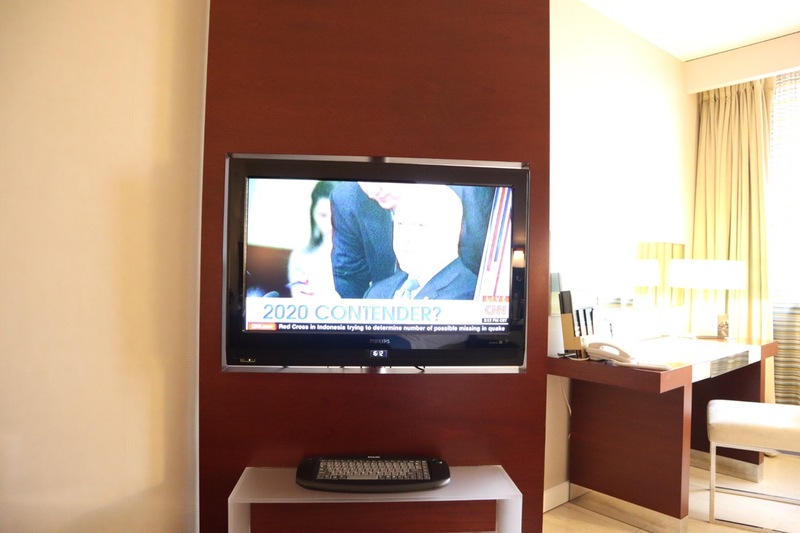 If you like to watch television to catch up on the day’s events, the Intercontinental has got you covered. Forty-eight inch flat screen television sets are mounted to the wall with a full complement of cable channels for your viewing pleasure. 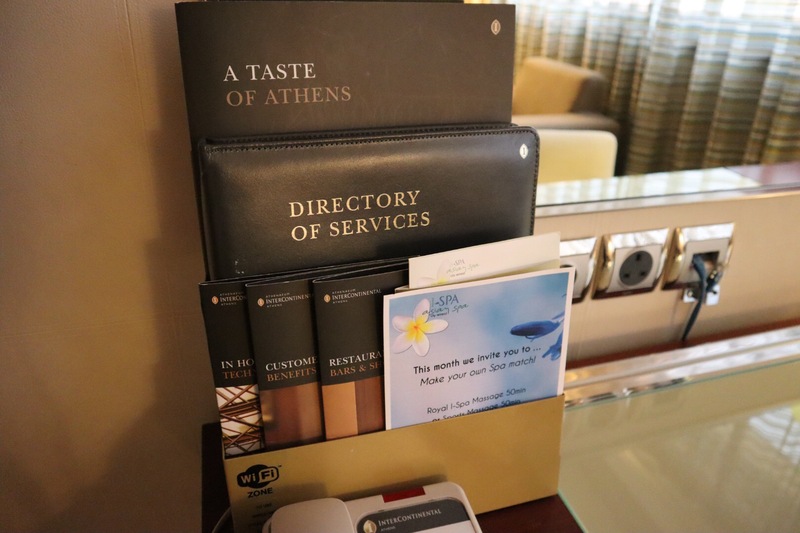 If you are looking for activities to do while in Athens, take a look at the directory in your room. 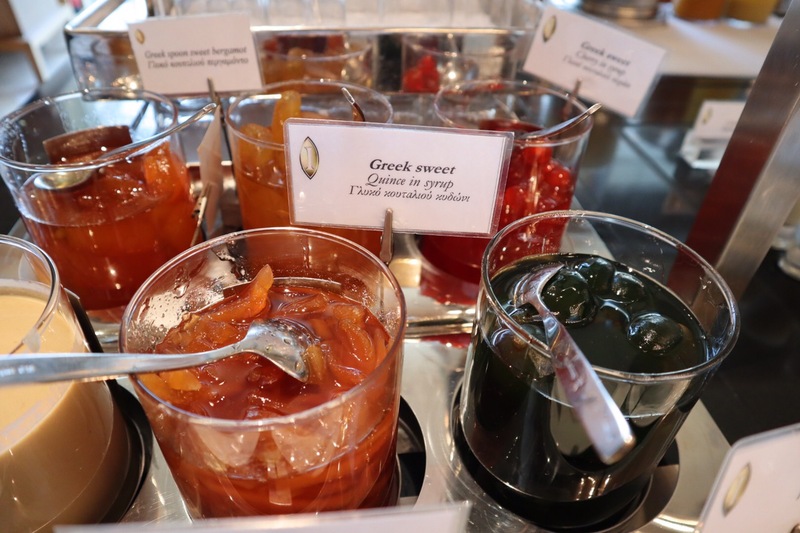 “A Taste of Athens,” is loaded with great suggestions for how to spend your time in the Greek capital. 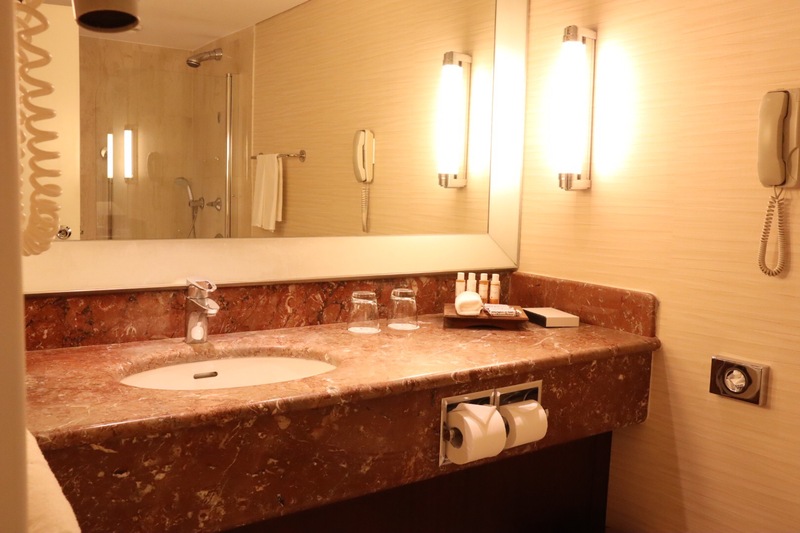 The bathrooms are spacious, well-lit and decorated in marble. 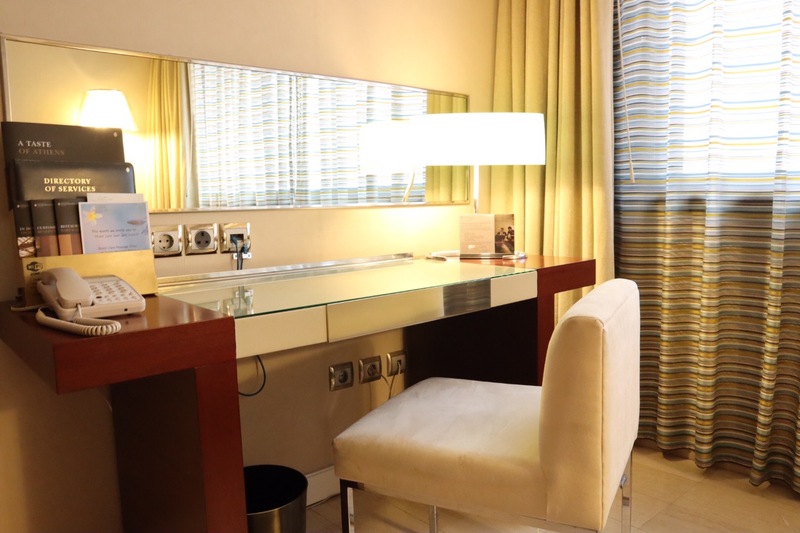 As you can see, the vanity comes in an unexpected burnished rust-colored marble. The shower provides options. 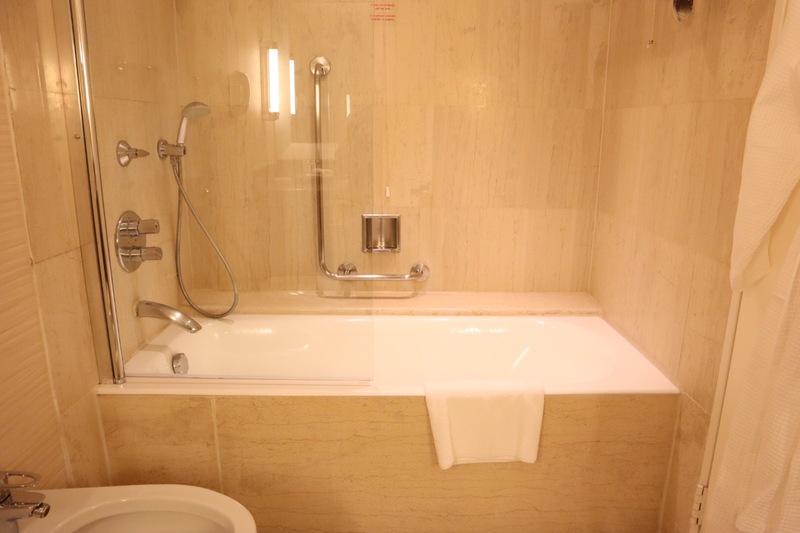 You can take an overhead shower or rinse off with the shower attachment. The water pressure was great. However, as a person with sizeable feet, the tub felt a little narrow while I was standing in the shower. My feet were rubbing against the sides of the bathtub so the tub could have been a little wider. 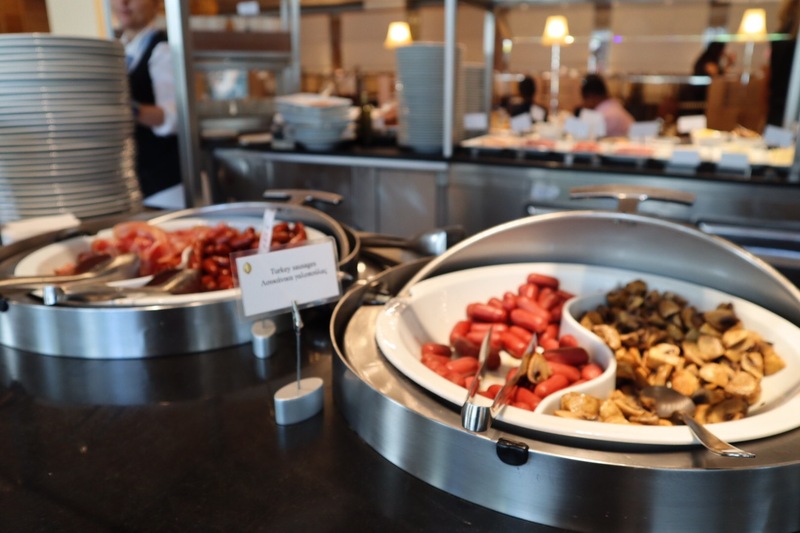 A favorite part of my stay was the breakfast buffet (32 Euro) at CafeZoe on the ground floor. 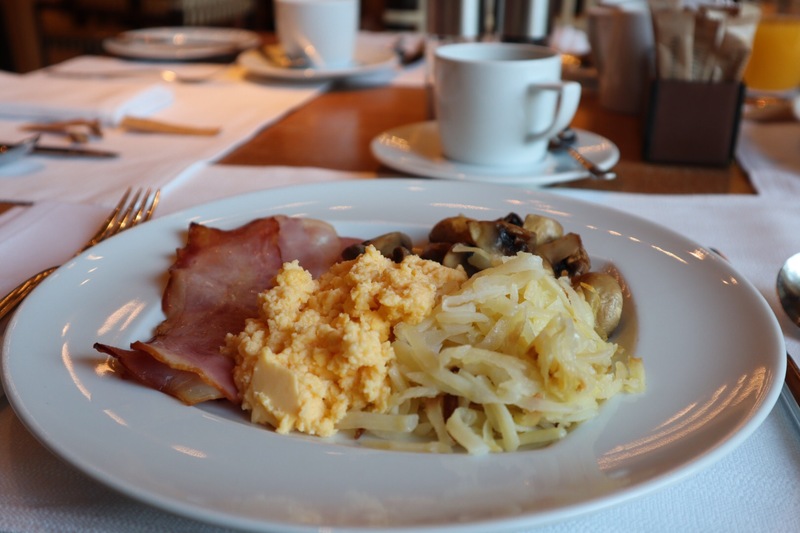 The breakfast (or “proino gevma” as they say in Greek) includes all sorts of goodies: bacon, scrambled eggs, mushrooms, hash browns, fresh seasonal fruit, muffins and even quince in jelly. If you want to work out, you have options. You can take a dip in the outdoor pool. Or you can workout in a full gym with TechnoGym treadmills, free weights and machines. ← New York City Gay Pride Parade 2018: The Lowdown!